The compost toilet systems featured on this page are all central systems. 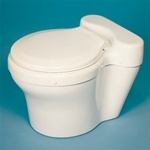 A compost toilet central system is ideal for those who want a traditional looking toilet in the bathroom, and who have the ability to install the central system in a lower level, cellar, or basement. We offer many types of central systems, including electric compost toilets, compost toilets that don't require electricity, compost toilets that use water, as well as waterless compost toilet units. Click on any of the subcategories above to narrow your choices. Are you feeling a little overwhelmed by all the options and choices? Let our Product Selection Guide help clear things up. The Product Selection Guide lists every model we sell, along with the most important specifications, such as electric vs. non-electric, water flush vs. waterless, capacity ratings, etc. By perusing the table of products, you should be able to narrow your search to a few units that might be right for you. If you still have questions at that point, please feel free to call us at 800-690-0132. We are happy to help, and we look forward to talking to you! Most of the units we sell do require some consumable accessory items, such as a peat moss bulking mix, Microbe mix additive, or special cleaning sprays. For a complete list of accessory items and prices, please visit our Accessories category. Please be sure to note that we offer quantity discounts on most accessory items, and you can save a lot of money by buying in bulk. If you have any questions about what types of accessories you'll need or how to order, please don't hesitate to contact us. Before getting ready to buy any unit, it's important to fully read and understand all the technical specifications and installation requirements. This is why we've posted a complete Product Instruction Manual and installation guide for every product we sell, and we strongly encourage our customers to download this document, and spend some time thoroughly reading it before you get ready to make a purchase. The Product Manual contains all the detailed information you need to know before buying a waste management system like this. Remember, these systems are an investment, and before making any investment, it's always a good idea to be well educated. The Product Manual will address such issues as installation location, tools and information required, whether a drain will be necessary, winter use and maintenance, and spring start up procedures. If you have questions about anything you've read in the Product Instruction Manual, please feel free to contact us. The time to address such questions is always before you buy! Once you're ready to order, please know that we're always happy to take an order by phone. We can be reached Monday through Friday at 800-690-0132. Please leave a message if we're unavailable, and we'll get back to you as soon as possible.